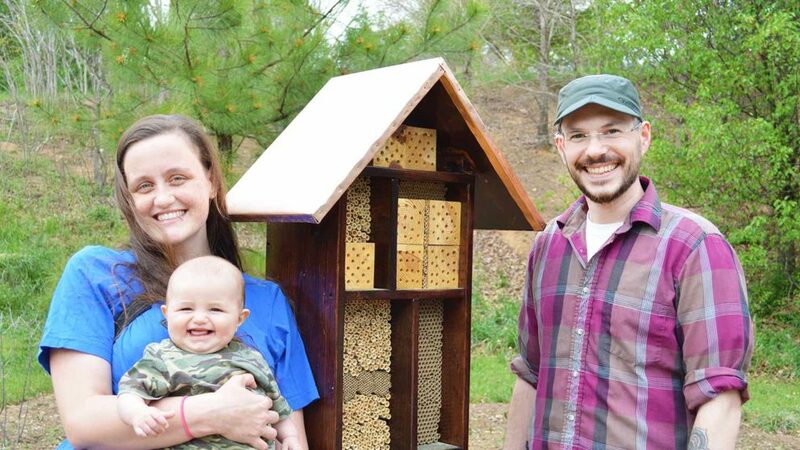 Jonathan and Sara June Giacomini with their son, Everest, and one of the bee hotels they built for NC State’s campus. There’s new on-campus housing that is something to buzz about. Jonathan, an NC State Ph.D. student in Applied Ecology, and Sara June, a research technician for a campus research lab, received a grant from NC State’s Sustainability Fund to install a bee hotel at three campus locations: outside Kilgore Hall, in the Court of Carolinas and along the Centennial Campus greenway trail. Under each copper-roofed bee hotel, there are hundreds of reeds and drilled holes that are a potential nesting spot for solitary bees. The holes vary in size and material to attract a variety of bee species, and all three hotels are strategically located near sources of food and water. “If we give the bees the opportunity, they will come,” Sara June said. In urban areas like NC State, bees are declining due to loss of habitat. Increased development and more manicured landscapes leave fewer fallen branches, brush and other natural elements in which bees can nest. About 30 percent of North Carolina’s 500 types of native bees are solitary cavity-nesting bees, which means they don’t live in colonies like honey bees. Female solitary bees build a single-occupancy nest to nurture her eggs until they hatch and begin the important work of pollination. 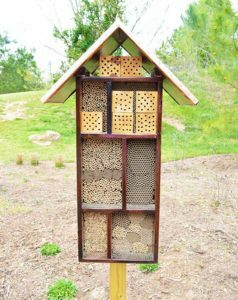 Bee hotels feature reeds and drilled holes in which solitary cavity-nesting bees can nest. Bees have also been of personal importance to the Giacominis, who met while working on bee-related projects as undergraduates at the University of Massachusetts at Amherst. “In a way, bees brought us together,” said Sara June. The Giacominis came to NC State in 2015 and wanted to build bee hotels on campus in order to raise awareness about the importance of native bees.